As many of you know, I’m a HUGE advocate for saying ‘no’ — not because I’m lazy, not because I don’t want to do my part, not because my life is super stressful, and not because my schedule is stretched to the max. I’m an advocate for saying ‘no’ simply because I know what my strengths and my gifts are, I know where I can use my talents best, and I know that by saying ‘no’, I’m actually saying ‘yes’ to a whole bunch of other things/people/activities that align with my goals and fit my current season of life. Plus, if I DON’T say ‘no’, there’s a pretty good chance my life will become super stressful and my schedule will become stretched to the max. I’ll end up doing a pile of things I’m not great at and don’t enjoy, while I shove off the things I’m passionate about, and the things that line up with my own personal goals and values. Now, certainly, we will NOT always enjoy or have a passion for everything we need to do each day — and there are lots of times we will need to say ‘yes’ to activities, jobs, commitments, and obligations we don’t necessarily jump for joy to do. However, when the choice is ours (as it so often is) I encourage you to say ‘NO’. So we’re good with saying ‘no’… right?!?! Well… today, I’d like to take things one step further. 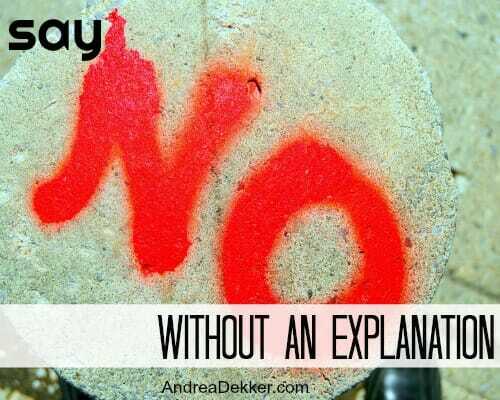 I encourage you to say ‘no’ WITHOUT an explanation! If you’ve never consciously thought about this before, I can almost guarantee it will be REALLY hard to do! No, sorry, I can’t be on that committee because I’m already on x, y, and z committees. No, sorry, I can’t stop by tomorrow because I have all my kids home with me. No, thank you, I don’t want dessert because I’m watching my weight and trying to cut a few calories. No, thank you, I don’t need your baby clothing because we already have so much. No, sorry, I can’t pick up an extra shift because I just want to go home and be with my family (or by myself!). No, sorry, we can’t attend the party because we have so much going on that week and our schedule is too full. No, sorry, I just don’t feel like I am gifted in that area and would rather use my time and talents elsewhere. Now, to be clear, I don’t think any of those explanations are bad or inappropriate. And, I most certainly understand WHY we feel the need to explain ourselves whenever we dish out a ‘no’ response. However, one thing I’ve noticed in my own life, is when I say “no + explanation” the other person often comes back at me with a counter offer, a guilt trip, or another possibility for the situation. Let me give you a few more examples based on the explanations I gave above. but x committee will be finished next month and y committee has too many people so you could probably drop that committee instead. Oh just bring your kids, we’d love to see them too! One dessert won’t totally blow your diet… and it’s my famous cheesecake. You really shouldn’t miss out! I’ll just bring them along in case you want to look at them. Kids go through so much clothing you know! But you had off last weekend and I’d really like to be with my family for my child’s (insert special thing) this weekend. What’s one more activity? Maybe you can skip something else. You’re more gifted than I am. You would do a fantastic job — there might be a little learning curve, but I know you’ll be great! By giving explanations for our ‘no’ responses, we’ve opened the door for counter-offers and the need to say ‘no’ again, give another explanation or excuse, and maybe even lie to get out of something we simply don’t want to do. If we had just said “no, not this time.” the conversation would be over. I think the diagram below is funny — but also very true. If we say our ‘no’ hesitantly, with question, or with an attached explanation, there are so many times when that ‘no’ turns into a ‘yes’. Again, I’m not naive enough to think a simple “no” response will work every single time. I realize we often need to explain ourselves in order to be respectful, polite, or kind. And certainly, there ARE reasons to “give in” and change our initial ‘no’ responses to ‘yes’ based on the circumstances. However, by simply being mindful of how we phrase our ‘no’ responses and not offering needless explanations, will can save ourself time, energy, and the need to continually justify our actions and decisions to others. NO NO NO Never say no and sorry same sentence because that invites a WHY. I taught a class to women who had lost their children because of neglect or abuse. The degree of stress they felt was inprortionate to what they were actually experiencing. One thing we had to tell them was children, spouses, parents and employers all had expectations. Often unrealistic. This had to be tempered on the part of the women. She had to realize that it was not an assault on her, not personal. 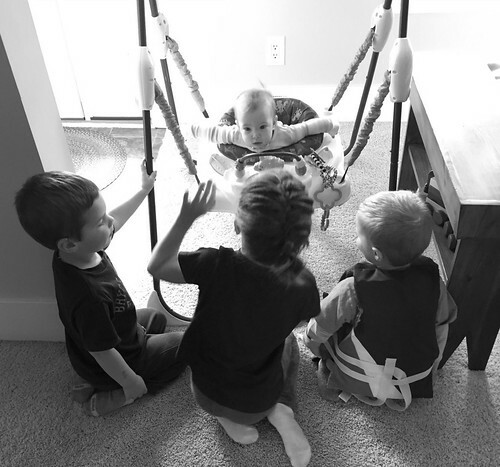 To diffuse the situation we gave her tools to say no by saying yes. Attend a meeting? I’d love to however Shirley Jones would be a better choice. Makes asker think it’s their idea. Takes the pressure off. If they persist firmly state I’m willing to help you find someone. Toddler wants cookies? They always want cookies. It’s their nature to crave goodies and to test boundaries at the same time. Say yes to the cookie but set a time. Do not offer a choice if you don’t wish to accede to one. Simply say, I have a better idea. Let’s make cookies after lunch. Or lets read a book instead of having a snack. Husband wants errands done. Set up and errand day and make it clear that you will do any requests put in writing such as on a post it or a honey do list (writing makes both people accountable) on your errand day and then make sure you stick to it. My husband is a business office attire type of guy. He needs his shirts and slacks sent out. I recently had to switch dry cleaners and the new one was next door to a Kuman tutoring place. I have nothing against tutoring but the moms would double park, sit in their cars, stand outside and chat and made it impossible to drive through the lot. So…had to tell hubby we need different way to deal with this until summer vacation ends so I’m going to do this particular errand early every Saturday instead of every Tuesday after grocery shopping. Boy you’d think I’d told him to go to work naked. But once he adjusted to the idea that what he wore of Friday need to be in my trunk by 8 Sat or it wasn’t going he got with the program. That’s just an example of how controlling our environment and sticking to a flexible schedule works for everyone in the long run. 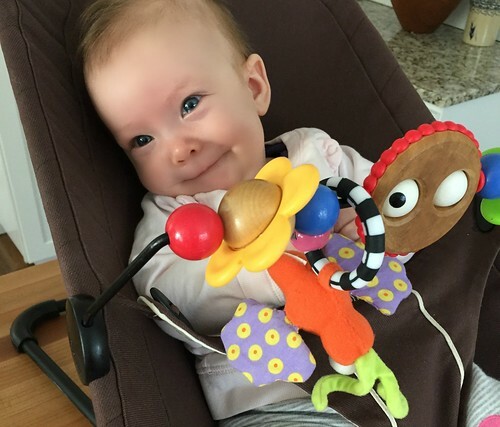 When my granddaughter was small I really had to adjust to the demands of a baby and then a toddler. She got dropped off at about 8. Sometimes she’d eaten and other times she’d balked at being hurried. We all know what happens when we try to force a kid to eat fast. My daughter experienced the worst of that until I explained it’s really simple. Pick food that packs up and send it with her. Let her pick what she wants within reason and do not make me the mean grandmother that has to say no all the time. I guess my point is, try to make your answer a yes whenever you can. But a yes with conditions. Everyone hates to hear no. I really think it brings out their inner brat. Especially if they are feeling a little overwhelmed themselves. So smile and say yes we can do that, in about 5 years! 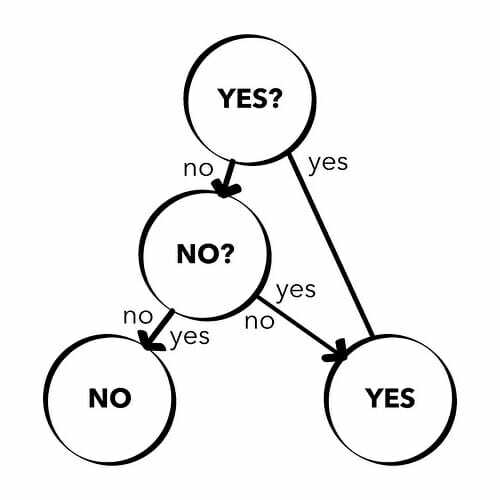 So… I actually use this technique with my children all the time (trying to say yes as often as possible) but I feel like it’s a little snotty, maybe even passive-aggressive to use it with other adults. It almost seems like I would be making a joke out of their question if I said, “yes, I can be on the committee… in about 5 years”. Instead of just saying, “no, not right now”. That said, your examples were great — definitley something to think about. I saw a little clip of Jerry Seinfeld on the Ellen show and he talks about the freedom that age brings. The freedom to say No. It’s hilarious! The confidence definitely came to me with age. Now, I just , no thanks. We often forget that “no” can be a complete sentence. I do this exact same thing. Even though i know i don’t need to explain myself, I constantly feel like I should. Definitely the people pleaser in me, and it’s something I’ve been consciously working on after having my 4th baby 6 months ago. Yes! Great advice. I have always been the person to over explain things like: we can’t go, because (reason x, y, z) etc. You are right about the other person having a counter offer which leads you to have to have to make another decision or put you in a situation where you have to find yet another excuse to the counter offer! This for some reason reminded me of an article I read a few months ago that asked what would happen if we replaced “Sorry” for “Thank you.” Example: “Sorry for being late, followed by explanation A” or “So sorry my child is throwing a tantrum” etc.and replace it with “Thank you so much for your patience (and maybe no explanation needed). It talked about there’s less guilt when phrased that way and can make both people feel better. oh my word — I love this so much. Thanks for sharing! I’m definitely going to try using “thank you” instead of “I’m sorry”! A great post Andrea! This is something I have been working on for a few years now. I noticed that every time I would say ‘no’ I felt I had to explain. That is part of the people-pleasing syndrome! I would have to justify. Now, I consciously work at not explaining why I am declining! Have a wonderful day Andrea! I have a friend who is a priest, I once asked her how she coped when always being asked to do things, be places, have dinner with people etc…she said exactly what you said…she said I just say no…no explanation just no and it works…people don’t even try to convince you otherwise…I think sometimes they are just a bit taken a back when you say ‘no’ but they move the conversation on to something else. It is great advice – but I still really struggle to do it!!! A good friend of mine shared with me that she will decline meetings, invitations, etc, by simply saying, “I’m so sorry, I already have plans.” No one needs to know what those plans are. Those plans may be to sit on the couch or take a bath, but those are your plans. I have adopted this practice and it works well. That is exactly what I do. Thanks, but I already have a commitment and no one needs to know it is to get in my comfy clothes and relax! So true. Must be a hot topic this month because Flylady Kat did a YouTube video two days ago on this very topic. Dr. Kevin Leman who is a wonderful Christian psychologist talked about this topic a few years ago and he said that women have a problem saying “no” without an explanation which brings this downward spiral where they end up doing the very thing they didn’t want to do. They come up with a reason, like you said, which opens the door for the other person to come up with a solution for each reason. One thing that I also liked was when Flylady Kat mentioned that when we’re on budget and we can’t afford an extra donation, we should just say “no” when the cashier at the grocery store asks us if we want to support a certain cause. After all, we’re the only ones paying our bills and we don’t need to justify ourselves when we say “no”. My husband is very good with this whereas I always feel guilty. I’m learning that the person asking just wants a “yes” or a “no”. The explanation is more for me than for the other person. Women have this problem more than men, in my experience. We apologize and we explain when we don’t need to. This post is good advise, especially for people that have goals and reasons for what they do and don’t do. P.S. The photo of the 4 is adorable! Especially because James is wearing a life jacket! yes, they were big on life jackets a couple weeks ago since we went to the pool over spring break! You (and he) are right! Going to try to make this a new habit for me! I often feel the need to explain. And I almost explained why I explain. This is good! Thanks! when asked to come to an event I will say “sorry, we already have a commitment” they do not need to know I am planning a quiet evening at home or whatever! Well, if Clara is on my side, I can totally do it! Lol. That pic of Clara at the end made me giggle.